Imagine, if you will, an international league of micronations, the rulers, founders, and monarchs of every self-declared nation in the world gathered in one stately building. A band playing the national anthems of Talossa and Sealand herald the dignitaries’ arrival while the flags of Molossia and the Nation of Celestia flap in the breeze. The leaders look dapper in their surplus military uniforms, and their official splendor is furthered by their sashes, hats, and collections of medals pinned on their chests. That the official finery is costume jewelry and secondhand suit is immaterial to the fact that these individuals are leaders of entire nations. For the uninitiated, a micronation is a self-declared country or territory, typically existing on land that is uninhabitable, unreachable, already claimed, or sometimes simply nonexistent. Hundreds of unofficial nations have popped up over the past decades, all claiming independence or sovereignty with varying degrees of seriousness. 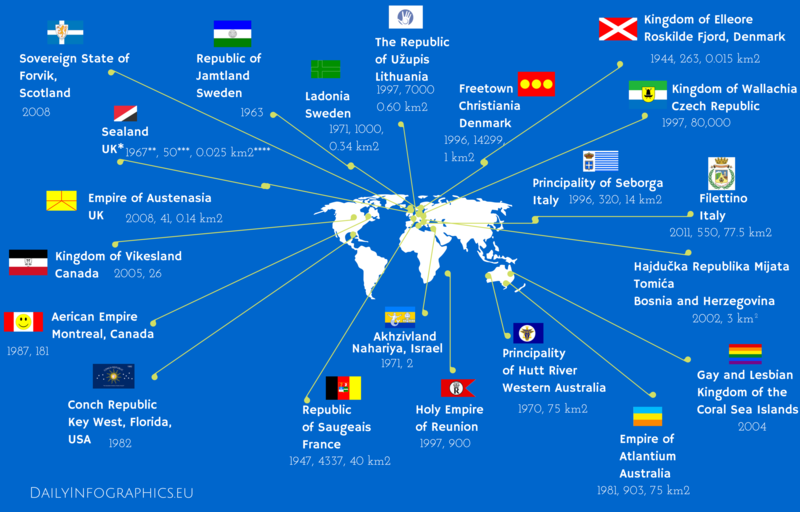 While a few micronations have succeeded in being acknowledged by “official” countries (or sort of acknowledged, at least), most go recognized only by the leaders of other micronations. As one writer put it, running a country is a “fantasy immediately comprehensible.” Most of us wonder about running our own country from time to time, and what better way to put this fantasy into practice than by actually doing it? As the posts on this page will show, micronationality isn’t just about acquiring tangible landmass, it’s about the pursuit of a dream. What those dreams look like in practice is the true legacy of each micronation. Micronational history is full of humor, political ambition, and one of the world’s most complex invented languages; the story even involves murder, thievery, and fraud. This blog opens the atlas of micronations to take a look at this rich, alternate world history. The League of Micronations is a clearinghouse for information about the world of these miniature countries, and will include pictures and reports from all over the web, as well as original content.